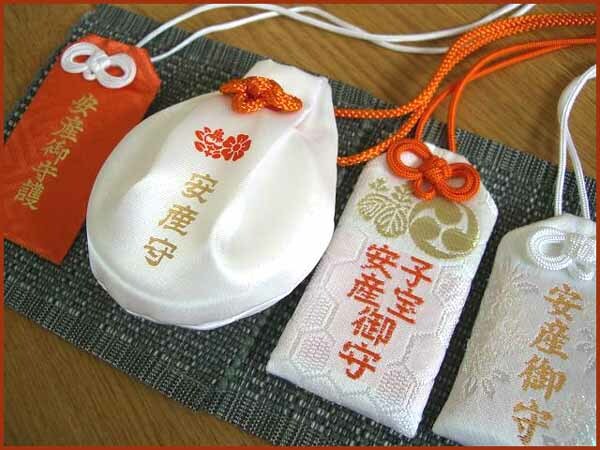 The most important item you buy when visiting a temple or shrine is some proof that you have been there, and the cheapest is a small keyholder with a little object and a little bell attached to it. 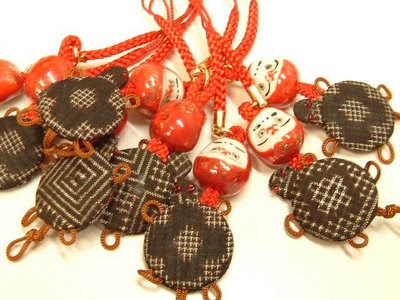 The objects can vary from the animals of the Asian zodiac to some special thing that will protect you in a certain situation.
. Amulets during Pregnancy .
. Hioka jinja 日岡神社 in Kakogawa, Hyogo . A special shrine for safe delivery prayers. 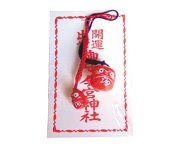 It is a custom to pray for a safe delivery and support during childrearing and go to a temple or shrine to buy a special talisman for this purpose. 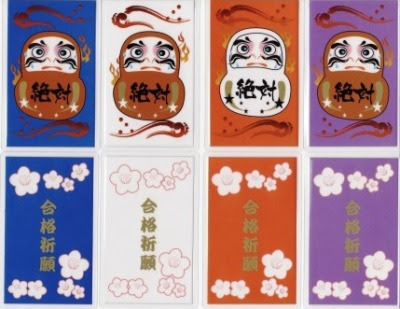 During the Edo period, raising a healthy child was quite a different undertaking from now, so people made an annual visit to a temple to pray, until the child was 13 years. 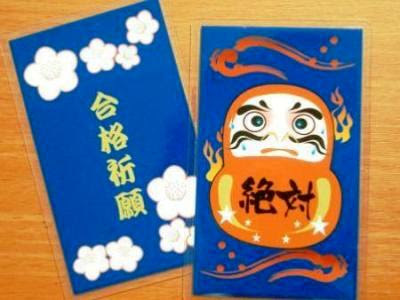 During the Edo period, there was a custom to bring a child to a special temple every year after birth until it was 13 (juusan). There was a different deity at each temple to introduce the child to and these 13 deities corresponded to the 13 benevolent deities that would later help the soul of the deceased to make its way through the various courts and judgements of hell, to have a good lawyer in the netherworld, so to speak. To visit a different temple each year soon was too much for the busy people of Meiji times, so they cut it down to two visits, one after the birth and the last at age thirteen. There would soon be temples where the statues of all 13 deities were assembled to facilitate the visit. Since the main deity for the 13th visit was Kokuuzoo Bosatsu, his statue had to be the biggest. At Kakuon-ji temple in Kamakura, there is a cave with the statues of all these 13 deities well worth visiting. It is said that the habit of this final temple visit started at the Hoorin-ji temple in Saga, Kyoto. When boys and girls reached the 13th birthday, usually the body starts to change and this sometimes means trouble. To ward all things off the family performs the last visit to a temple of Kokuuzoo Bosatsu to give thanks for sucessfull childrearing and pray for good fortune as a grown up. The special day for this visit was the 13th of April, the Special Day (ennichi 縁日) of Kokuuzoo. On the way back from the temple, you had to cross the bridge Togetsukyoo (渡月橋) at Arashiyama and until then the child was not allowed to look back, since this would reverse all the good luck just received at the temple - at least that is the folk lore. Here is a list of all the 13 deities involved in this pilgrimage. 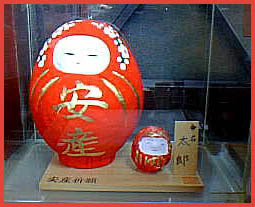 And even Mister Daruma with a headband is waiting for the child to be born, ready to give it a new name on the name card. Anzan Taue Rituals - praying for safe birth and rice planting, shrine officials dress up as cows and young women and plant rice. 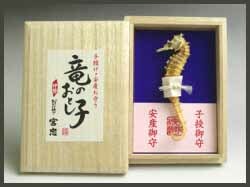 One very famous historical Anzan Talisman in the shape of a crystal pearl was used by Fujiwara no Ishii and then donated in 1034 to Kashima Shrine, later it was also used by Emperess Jinguu Koogoo. Ichi no Gozen Anzan sui "Water for an easy delivery"
The story goes back to the Muromachi period, when a young woman (Ichi no Gozen) got the water from the lord of the domain and then had an easy delivery. 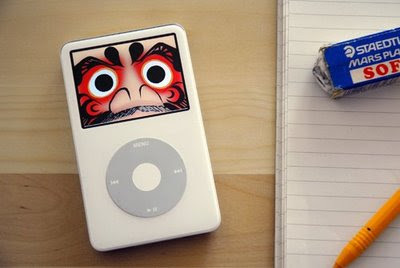 So there is a connection with Daruma and a safe delivery. 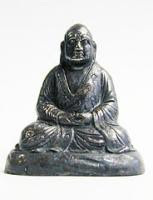 Usually the Buddhist deities Kannon Bosatsu or Jizoo Bosatsu are responsible for problems with children. 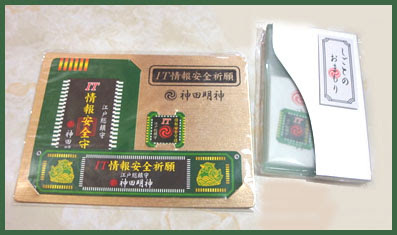 But Anzan Talismans may even have been used during the Yayoi Period. When we were pregnant with the idea of buying an old farmhouse, a priest at Daisen Shrine told me to buy his Anzan Mamori. but for anything new you start, a business or something. And he was right: after just two months (very fast and seldom in this part of the traditional countryside) we bought our new home, Paradise Hermitage (GokuRakuAn) and have lived happily ever after with this new CHILD Venture! A green one is available too. 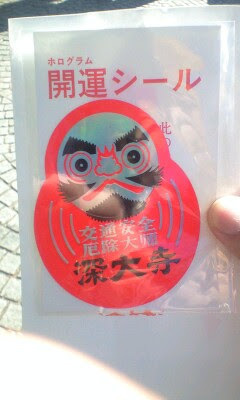 Daruma san is also often used as o-mamori, even in the version with his eyes popping out as a sign of extra good luck. Me ga deru. Click on any of the pictures for the small talismans, wooden votive plates (ema) and the others. the article says that Shinto believes "...nearly every object in the world, animate or inanimate, has a spiritual essense....therefore anything can be blessed, from a newborn child to an automobile." 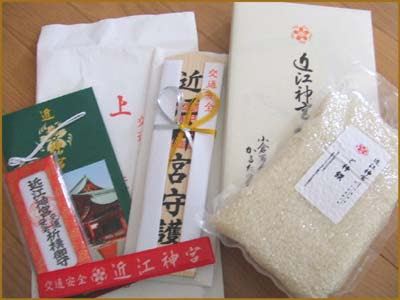 3 go of rice and some senbei are in the package for traffic safety. 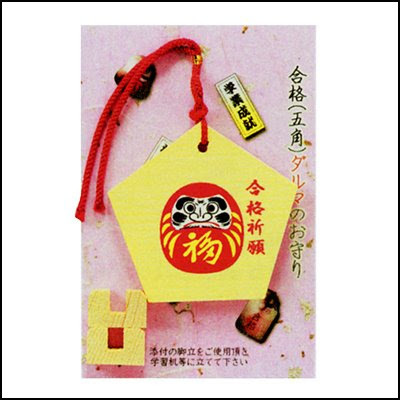 This is a special small wooden plate you buy at the temple or shrine, write your wish on the back side and hang it on a special board provided in the temple grounds. 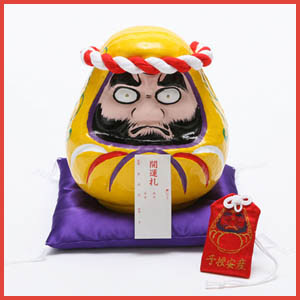 Here is a little Daruma figure to protect you. Further down on this page you can see a lot more of other Buddhist deities as personal protector statues. another version of the ME GA DERU !
. 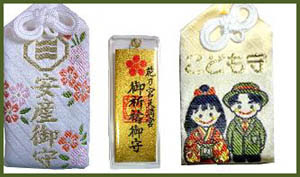 Talismans, Amulets and Toys of Japan . ryuu no otoshiko 竜のおとし子 "born child of a dragon"